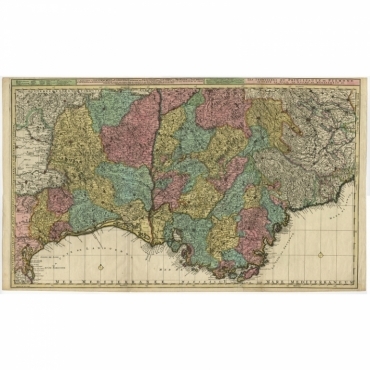 Antique maps of France. 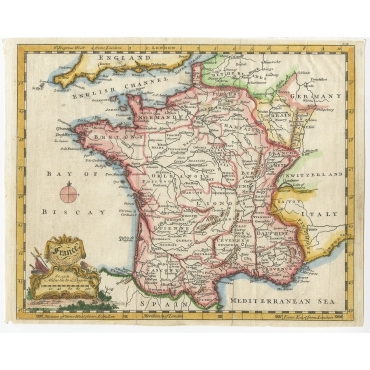 The history of the cartography of France goes back to the Middle Ages. 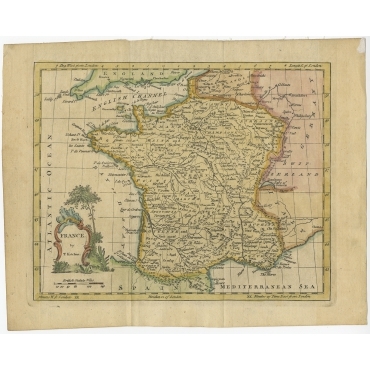 The first antique map of France ever published was a woodcut map. Throughout the centuries, cartography techniques developed. 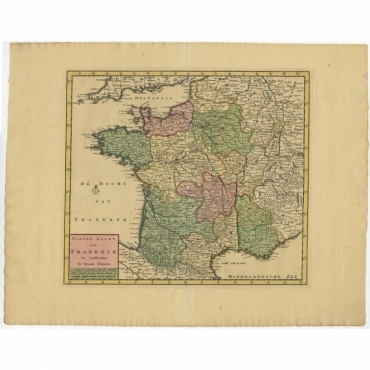 Even Napoleon got involved in the publication of antique maps of France, but his primary goal was to produce battlefield maps. 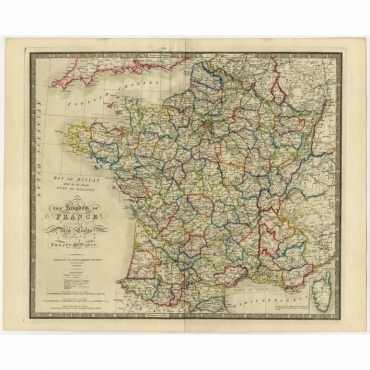 Our antique maps of France reflect the great history of this country including antique maps of the French provinces, antique maps of the French coast, antique maps of the Kingdom of France and antique maps of French cities. Antieke kaarten van Frankrijk. De geschiedenis van de Franse cartografie gaat terug tot de Middeleeuwen. De eerste antieke kaart van Frankrijk was een houtsnede. 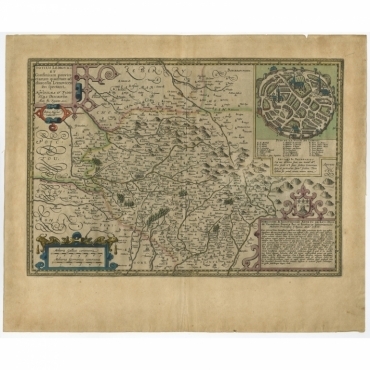 Door de eeuwen heen ontwikkelden de technieken van de cartografie. Zelf Napoleon ging zich bezig houden met cartografie, maar zijn primaire doel was vooral om kaarten te publiceren van de slagvelden. Onze antieke kaarten van Frankrijk weerspiegelen de geschiedenis van het land. Bij Bartele Gallery vindt u antieke kaarten van de Franse provincies, antieke kaarten van de Franse kust, antieke kaarten van het Koninkrijk Frankrijk en antieke kaarten van Franse steden. 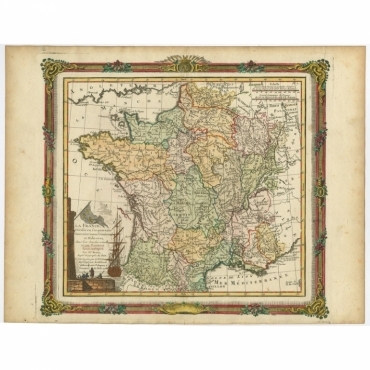 Antique Maps | France There are 87 products. 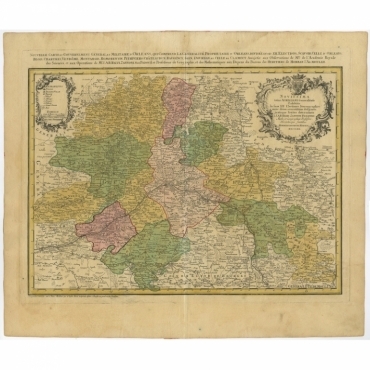 Antique print, titled: 'Mappa Geographica in qua Ducatus Lotharingiae et Barr (…).' 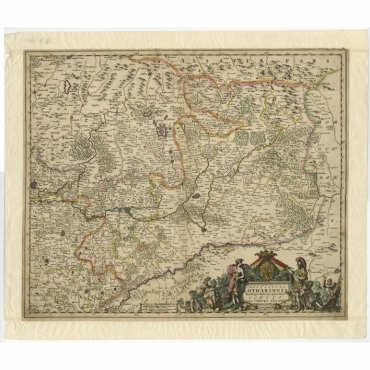 - A very decorative map of the Lorraine region in France. Detail includes that of the towns, cities and topography. It has a title cartouche showing people hunting and making wine and cheese. The scale cartouche is topped with a putti making maps. Antique print, titled: ' La basse Partie du Gouvernement de Languedoc, environne des Frontiers des Gouverns de Provence, de Dauphine de Lyonnais et de Guienne et Gascogne ; Les Frontiers du Principaute de Piemont.' - Very large and highly detailed map of the Languedoc-Roussillon and Provence regions in France and Piedmont in Italy. Antique print, titled: 'Exactissima Lotharingia tam Regis Gallorum quam Ducis.' - Striking map of Luxembourg and Northern France. Includes the cities of Toul, Nancy, Metz and Trier. Embellished with a handsome title cartouche. Antique print, titled: 'Berga Sti Winoci.' 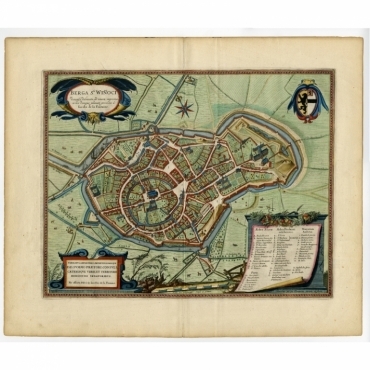 - Bird's-eye view plan of Sint-Winoksbergen in France, with key to locations and coats of arms. Text in Dutch on verso. Antique print, titled: 'Nieuwe Kaart van de Opper en Neder Rhynse Kreits nevens het Hertogdom Lotharingen.' 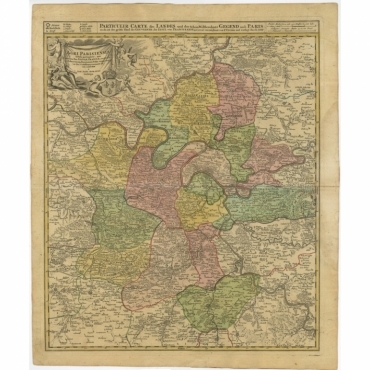 - Attractive detailed map showing the Rheinland and Lotharingen, Germany and France. Antique print, titled: 'La France, divisée en ses quarante Gouvernemens Généraux.' 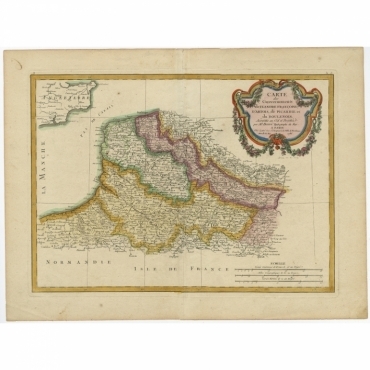 - Attractive map of France by Brion de la Tour, published by Desnos. The decorative border was printed from a separate copper plate. Antique print, titled: 'Nieuwe Kaart van Frankryk.' - Attractive detailed map showing France. Title in block-style cartouche with a simple compass rose. 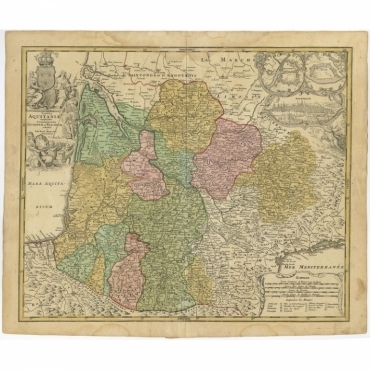 Antique Map, titled: 'Tabula Geographica Campaniae (…).' 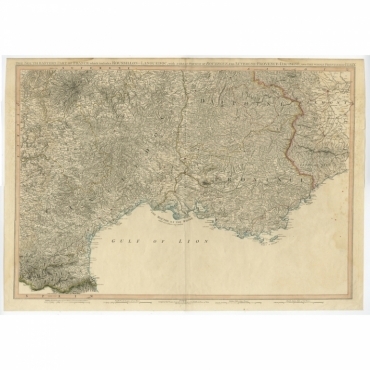 - Detailed map of the Champagne region in France by J. B. Homann, covering the region Champagne-Ardenne with Reims, Troyes and Épernay. 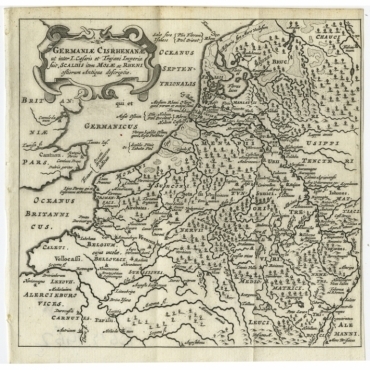 The map shows an allegoric cartouche as well as two city views; Reimes and Troyes. 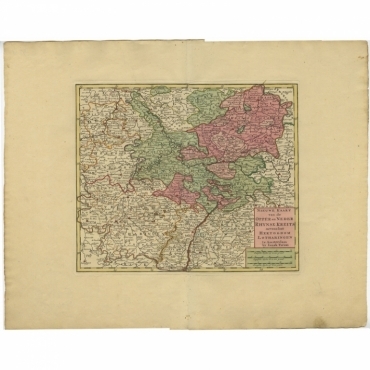 Antique Map, titled: 'La Generalite Proprie Taire De Lyon (…).' - Detailed regional map of the Beaujolais region including the cities of Lyon, Clermont Ferrand, Roanne, Saint Etienne and Vienne. Fully engraved with mountains, forests and tiny villages. A decorative title cartouche incorporates a legend and distance scale. 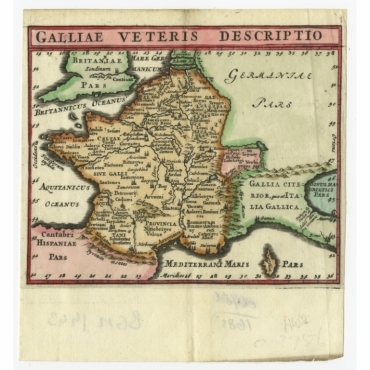 Antique print, titled: 'Galliae Veteris Descriptio.' - Charming miniature map of France from the pocket atlas 'Introductionis in Universam Geographiam tam Veterem quam novam .. Acessit P. Bertii (Bertius) Brevarium Orbis Terrarum', by Ph. Cluverius (Cluver). 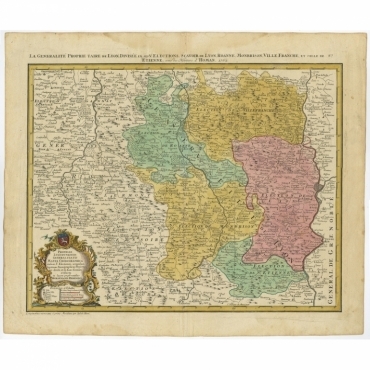 Antique print, titled: 'Inferioris Germaniae Descriptio.' 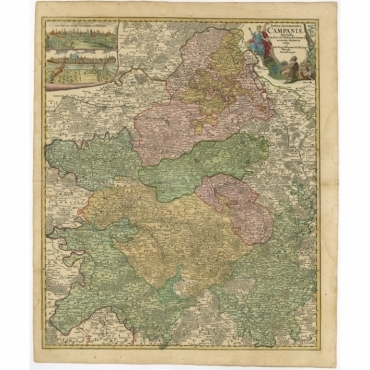 - Charming miniature map of the Low Countries with Belgium, The Netherlands and parts of Germany and France, from the pocket atlas 'Introductionis in Universam Geographiam tam Veterem quam novam .. Acessit P. Bertii (Bertius) Brevarium Orbis Terrarum', by Ph. Cluverius (Cluver). Antique print, titled: 'Germaniae Cisrhenanae ut ineter I Caesaris et Traiani Suit imperia Scaldis Item Mose ac Rheni.' 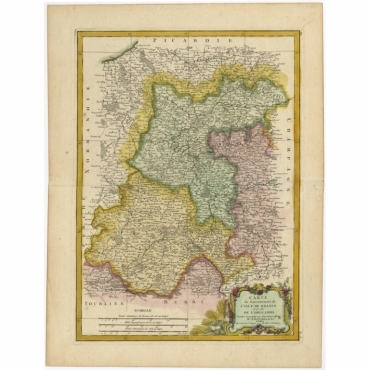 - Miniature map of the Low Countries and part of Germany and France. From the pocket atlas 'Introductionis in Universam Geographiam tam Veterem quam novam .. Acessit P. Bertii (Bertius) Brevarium Orbis Terrarum', by Ph. Cluverius (Cluver).